AzhwAr talks about the supreme nature of emperumAn since he, who is the mother and father for AzhwAr, is the causative factor for all the worlds, including brahmA, rudhra et al. Alternatively, we can say that this pAsuram talks about such simplicity of emperumAn that he gave place, in his divine form, for even brahmA, rudhra et al. mUrththi – Oh my lord! uraippadhu ennE – how to talk about? thani ninRa sArvilA mUrththi – Oh emperumAn! During the time of great deluge, you stood with all the resultant entities (which are created by causative entities) as part of yourself without any name or form, having integrated themselves into their causative entities; you did not have anyone in whom you could take refuge [unlike these resultant entities who took refuge in you, along with their causative entities, all of them without any name or any form]. The term sArvu refers to being related to something or leaning against something; thus in this context it refers to emperumAn being without anyone on whom he could lean against. Did not vEdha (sacred text) also glorify emperumAn, as mentioned in thaiththirIya upanishath nArAyaNavalli “pathim viSvasyAthmESvaram SASvatham Sivamachyutham” (being the lord of all the worlds, being ISvaran himself (one who controls everything), being intransient, being auspicious and being one who will never let down his followers), saying that he is the lord for all the worlds and that he does not have one who will control him! Alternatively the term sArvu would also mean “comparable” and hence sArvilA mUrththi could be said that emperumAn is incomparable. Just as krishNa says in mahAbhAratham AshramavASika parvam 118-37 “rudhram samASrithA dhEvA rudhrO brahmANamASritha: I brahmA mamASrithO rAjan nAham kinchidhupASritha: II” (Oh king! 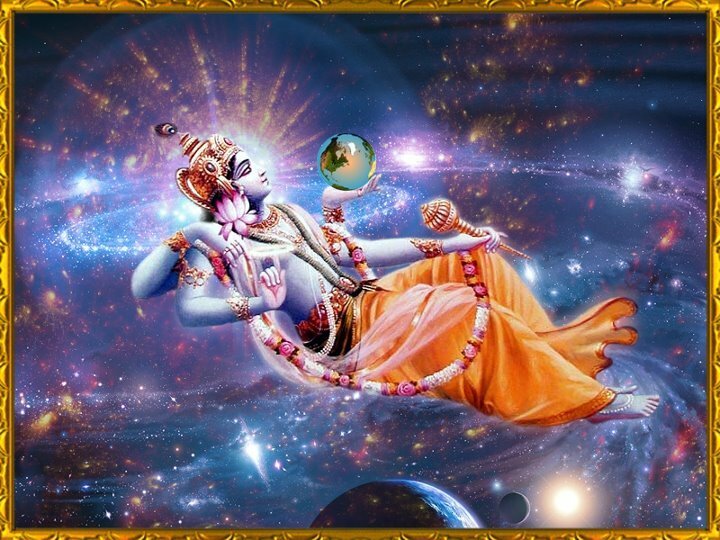 The celestial entities are taking refuge of rudhra; rudhra is taking (his father) brahmA’s refuge; brahmA has taken refuge under me; I have not taken refuge under anyone), since emperumAn is the head for all, there is none who could be said to be his equal. AzhwAr further says that the two entities who are thought to be equal to emperumAn are under his control. . .
pani nIr agaththulavu senjadaiyAn – rudhra, who has reddish matted hair and has gangA inside that hair, is residing in a corner on your divine form, as mentioned in thiruvAimozhi 1-3-9 “valaththanan thirupruam eriththavan” (the one who burnt down the three towns has taken residence on your right side). nAngu mugaththAn nin undhi mudhal – brahmA, who has four faces, has your divine navel as his root. How can I talk about your greatness or your simplicity? We will take up the 72nd pAsuram next. This entry was posted in iyaRpA, periya thiruvandhAdhi on January 22, 2019 by T N Krishnan.